Microsoft's rebranded cloud storage platform OneDrive (soon to be nee SkyDrive) will offer up to an extra 8 GB of storage for users who complete certain tasks, according to MS-focused news outlet LiveSide. LiveSide reports that users will receive 500 MB of extra space for every new user introduced to OneDrive, upto 5 GB. Users will reportedly receive a further 3 GB for choosing to sync photos from their iOS, Android or Windows Mobile devices. The offers will be aimed at encouraging uptake of OneDrive following its rebranding from the SkyDrive moniker. Microsoft was forced to change the name of SkyDrive after losing a trademark case with BSkyB last year. LiveSide previously reported that OneDrive will also feature 'co-owned folders', rather than just shared folders. Co-owned folders will act like personal folders to all users with the relevant access rights. 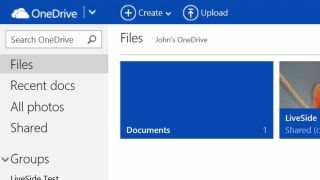 Microsoft has made no announcement about when OneDrive will be launched, but individuals can sign up for updates on the OneDrive preview website.